2Morrow provides digital coaching for tobacco cessation, chronic pain management, weight management, and stress programs that address unhealthy behaviors in a whole new way. By using an innovative behavioral approach called Acceptance and Commitment Therapy (ACT), participants learn strategies that are effective when dealing with unhelpful thoughts, feelings and urges that get in the way of long-term success. The personalized experience includes short lessons, advanced messaging protocols, customized tips, and access to a live coach for up to 12 months. A clinically-tested, digital coaching platform that drives engagement and impacts outcomes. Castlight and 2Morrow help employees stay engaged in some of the biggest challenges toward improving their overall health – quitting tobacco, and managing chronic pain, weight and stress. With deep integrations that allow employees to track their 2Morrow program progress in Castlight and earn points for meeting 2Morrow milestones, users get the reinforcement they need to complete their programs. Together, Castlight and 2Morrow can help employees stay more engaged and on track for success as they work toward their goals. 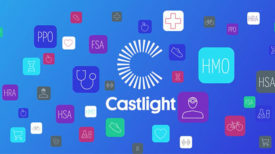 2Morrow is connected to the Castlight platform via a deep, data exchange integration. As users engage with 2Morrow, they earn points in Castlight for completing specific micro-actions, like tracking their urges and actions toward progress, which also helps power Castlight's personalized recommendations. Example micro-actions are shown. 2Morrow gauges progress in an employees' journey to quit smoking. Employees track their progress by recording urges to smoke, among other symptoms. Employees select programs applicable to their health goals.